Roasting pumpkin seeds is one of my favorite fall traditions and has been for many years. Since my daughter, Zoe, was born almost 2 years ago on Halloween morning my obsession with everything pumpkin has risen to new highs. 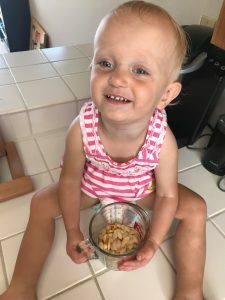 Little Zoe helping to make the fast and easy roasted pumpkin seeds in 15 minutes. This year I had Zoe assist me for my inaugural pumpkin seed roasting session of the season. The result: messy, orange pulpy hands, a lot of fun, and scrumptious, delectable roasted pumpkin seeds fresh from the oven. Best of all: she absolutely loved them! I have probably roasted pumpkin seeds a hundred times before with several different recipes. Usually with at least 10 steps each, 40 or more minutes of cook time and over 1 hour of total prep time. 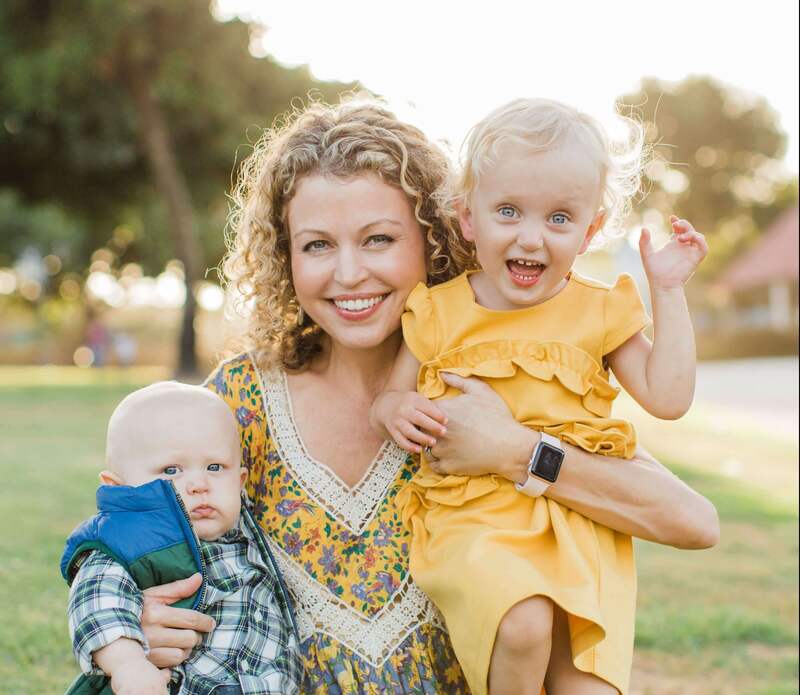 With a child, however, I don’t have that kind of time anymore. 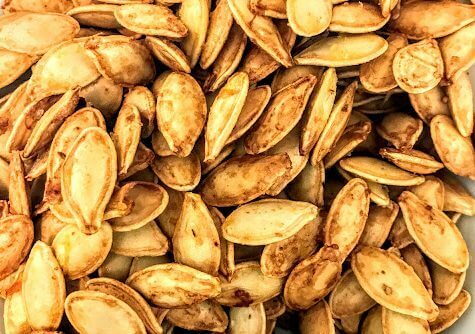 This is the fastest, easiest recipe for roasted pumpkin seeds in 15 minutes (and yes, they are still crunchy and super delicious). 2. Scoop pumpkin seeds out of pumpkin and into container. 3. For every 1 cup of seeds, add 1 teaspoon olive oil. Stir. 4. Spread seeds on greased baking sheet and roast for 15 minutes at 400 F.
That is all, folks. It doesn’t get much easier then that! Don’t feel like you have to wash the seeds. The extra pulp actually makes for a little extra crunch. Don’t use too much oil. I have made this mistake before (thinking that more = better tasting) and ended up with soggy seeds after one day. You can always add more salt to taste later so don’t go overboard before cooking them. Don’t let them cook for longer then 15 minutes because they will burn at such a high temperature. If your seeds are extra large you can add another minute or two, but no longer. Store seeds in an airtight container to prevent them from getting stale too soon. I like to use mason jars. You can substitute any oil you like (or butter). I just prefer the taste of olive oil. I hope you are are enjoying the start of fall!